The Cedar College Sports Centre, opened by the Hon. Kate Ellis MP in March 2011, is now a landmark building in the Northgate area, and is fast becoming a hub of the growing local community. 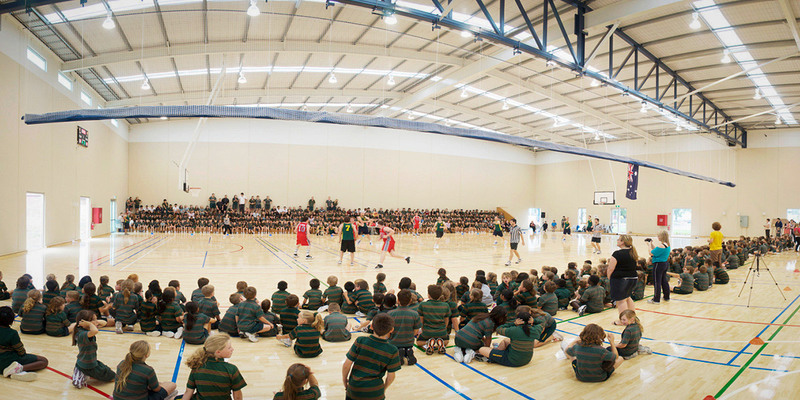 Built by Cedar College, with assistance from the Australian Federal Government, the $3M facility features a state-of-the-art sprung-floor gymnasium with two full-size courts and spectator seating, as well as a fitness & weight training area, and change rooms. The Sports Centre is available for hire for sporting groups/associations, and has hosted a number of international teams as well as local competitions. Equilibrium Fitness Studio, housed within the Cedar College Sports Centre, offers community health and fitness classes, in our facilitated by a qualified instructor on a regular basis. The classes have proved to be very popular with residents of Oakden and Northgate, and a wide range of classes are now available for people of all ages and fitness levels. Equilibrium Fitness Studio holds a range of fitness sessions throughout the week. Attend a gym class, learn Pilates, or have a workout, all at very affordable prices. Equilibrium Fitness Studio offers individualised Pilates sessions both in a group or one on one as well as postnatal and over 50’s fitness sessions. For enquiries, please contact the Sport Centre manager at [email protected] or to book, phone the Sports Centre manager on (08) 7221 3674 or 0467 253 547.